It would seem that versions after 5.86-3480 (5.88 and beta 5.89) do not show the temps properly for CPU temp and CPU Tctl/Tdie. 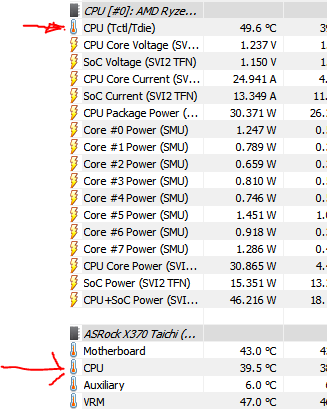 I cant tell what temp is showing now seems to put both temps to the same value and they seem about 3 degrees higher than Tctl which is the 'high' very quick responding CPU temp. When I install 5.88 program ends up reading CPU temp and CPU Tctl/Tdie the same unlike before (or close to the same, just slightly different). I went back to the 5.86 version because that seems to work on my Asrock x370 Taichi MB with my Ryzen 1700. The board can be set to have the two digit led display to show the cpu Tctl temp after boot and it matches the readings from the 5.86 version.. the 5.88 version not only doesn't show the proper temp of the MB CPU setting (the slow rising temp or what most would say the CPU temp is) it also seems to show the CPU Tctl temp being higher than it is. So whatever you did to the versions after 5.86 broke something that was functioning properly. The Ryzen 1700 processor doesn't have a Tctl_offset, so HWiNFO v5.88 is reporting it correct. In your case Tctl = Tdie. (10-02-2018, 11:00 PM)Martin Wrote: The Ryzen 1700 processor doesn't have a Tctl_offset, so HWiNFO v5.88 is reporting it correct. In your case Tctl = Tdie. I did a quick search but didn't find anything useful on the subject so I just made my own assumptions on it that are probably wrong but seem the case. Maybe the Tctl is what the cores are going to get to eventually as the system heats up or the actual temp of the chip more instantaneously but not very useful if you want to see how it will react over time or if you are running too hot. Either way, I preferred being able to show those differences and now it doesn't and also reports the wrong temps. I still have to say, whatever was done to the code after 5.86 broke something in the readings and its still broke in the beta. As I say, 5.86 still works properly and displays the temps properly and accurately .. 5.88 and above just doesn't. If this is how you are going to keep it from now on, let me know so I can stop it from checking for updates. Why would I want to stop using a version that works properly for one that doesn't work properly and will continue to not function the way it used too? See when I took this shot, my computer wasn't at 50 degrees it was at 39 but I happened to have reloaded a web page and i can see that its not 50 degrees and that its just being accessed at the moment I was looking. This is how it looks with 5.88: I have no idea what the actual CPU temp is I would just have to wait and watch it until whatever is running stops and the temps settle down again to their actual temps not the "instant short term temp"
My computer was still at 39 nothing changed but the version of HWiNFO ... just killed the app, changed the exe, launched it again then reloaded the web page again and took the screen shot. Maybe Tctl is actually not off and its just bad timing while reading the motherboard compared to the stats displayed on the screen (because Tctl changes so often) but the fact that the Motherboard's CPU Temp and Chip's CPU Tctl/Tdie are now the same reading but they should not be .. the two I marked above should not have the same values and didn't until 5.88. Hopefully you will see why I am reporting this bug in the latest versions and why its broken. OK, let me clarify this. Tctl is the INTERNAL temperature of the CPU and it can be trusted very well to be accurate on Ryzen series (unlike earlier AMD CPUs/APUs). This value will always be higher than other mainboard components (except VRM), because it's measured internally and will always change quickly (within milliseconds) depending on CPU load. Then, some mainboards can also measure the external CPU temperature - this is usually done via a sensor inside the socket. This value is not much relevant, because it doesn't reflect exactly how hot the CPU is running and will always change with a large delay (the heat from CPU cores is transferred to the surface and also affected by cooling). So Tctl/Tdie is the most accurate and relevant value. Now what happened in HWiNFO recently - I indeed made some changes to temperature reporting affecting your mainboard too by changing its source. 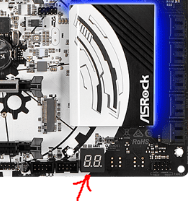 The problem is that mainboard manufacturers often don't state what they report as CPU temperature - if the mainboard sensor (Nuvoton NCT6779D in your case) is reporting the internal or external temperature. It depends on how they designed the mainboard and configured hardware monitoring. 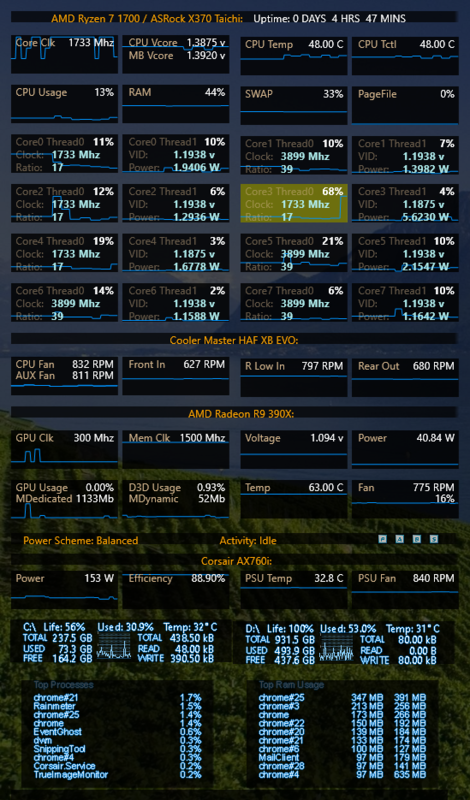 What is HWiNFO currently reporting as "CPU Temp" is the internal Tctl value. But.. let me check that in more detail, I will compare this with reference ASRock data and see if I shall bring back the previous (most probably external) value. For this I will need you to attach the HWiNFO Debug File. So I have just released v5.89-3525 Beta where I did some modifications for this case. (10-03-2018, 02:17 PM)Martin Wrote: So I have just released v5.89-3525 Beta where I did some modifications for this case. OCCT is horrible at detecting boards properly but with your explanation and what I noticed in OCCT ... I think I now understand the differences. Seems OCCT has CPU as one temp then core1 and core2 (even tho there are 8 it only shows 2) ... the CPU listing follows the CPU temp and the core1/2 basically follow the Tctl temp. Seems like the beta works great. 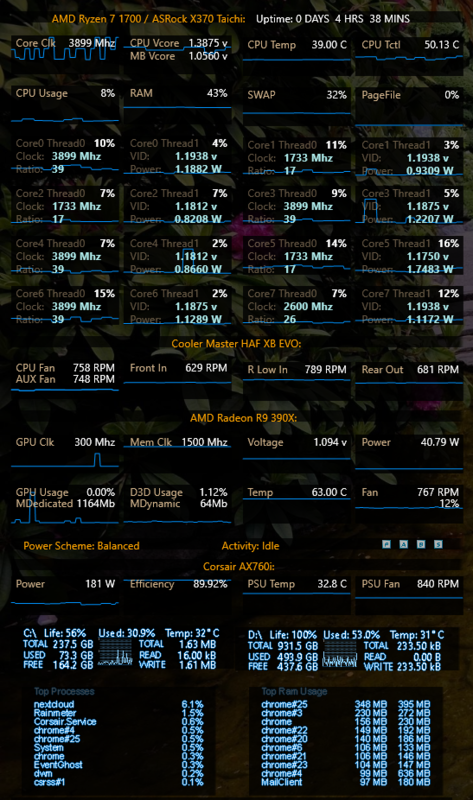 FYI - AMD CPUs don't offer per-core temperature reporting, they report just a single value for the entire CPU (most probably the maximum one). 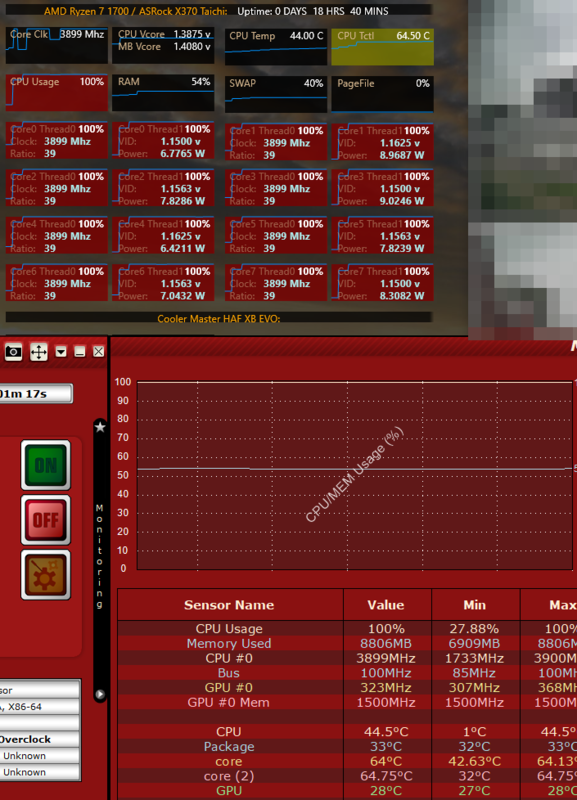 If you see a tool reporting multiple core temperatures on AMD, then it's a fake. (10-03-2018, 05:54 PM)Martin Wrote: FYI - AMD CPUs don't offer per-core temperature reporting, they report just a single value for the entire CPU (most probably the maximum one). Yeah kind of figured that out because OCCT sometimes only had one of the "core" values showing like Tctl and the other core was showing some weird value ...but thanks for the added info. OCCT hasn't been updated in a long time and I think the last version was before Ryzen so I'm sure the readings are all goofy with that app but ... it's a good stresser when I was overclocking.